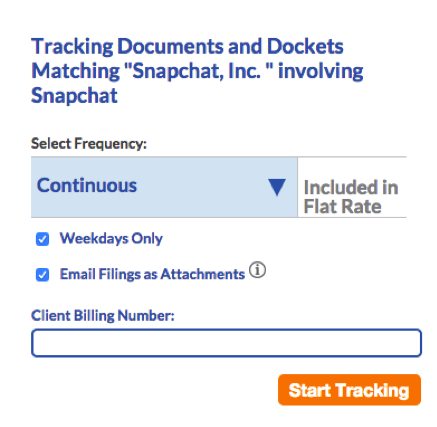 Instead of continuously searching disorganized databases, court dockets, and PACER, journalists can use Docket Alarm’s user-friendly search tool to see the latest court cases involving Fortune 500 companies, tech startups, and other entities. Then, using Docket Alarm’s Federal Court case alert tool, reporters can track developments related to specific parties and tech centers in order to stay up-to-date on the latest legal and business news. These updates can arrive to a your inbox anywhere from once a week to continuously throughout the day, ensuring you are immediately notified of any changes. For example, if you want to be the first to know about a lawsuit filed against Snapchat, you can set up an email alert to be sent to your inbox every time there is an update to any document or docket related to the company. To set up an email alert, simply enter Snapchat, Inc. into the Federal Court case alert tool. You can select how frequently you receive updates, and you can even choose “Continuous” updates to receive an email immediately when there is a new development to a docket or document. Docket Alarm’s updates are maximized to provide the receiver with the most essential and relevant information, ensuring you are never overwhelmed with data overload. Each email alert has an attached PDF of document that has been updated, removing the unnecessary step of having to log into the platform to see the latest news. Additionally, each alert comes with a brief summary of what is new, allowing you to quickly evaluate the update’s relevance. Join lawyers and financial professionals in utilizing Docket Alarm to stay ahead of the curve. Sign up today at http://www.docketalarm.com.